Nature salutes a Saint. At 3:40 a.m., in Martigney, France Marcel Lefebvre dies. At the same time, across Europe, and for two hours from New Jersey to Alabama, a display of brilliant Aurora Borealis is seen. Many colors illuminate the night, with a brilliant red, an unusual Aurora color, blazing. In Vestment symbols, red represents the Holy Ghost. Marcel Lefebvre belonged to the Holy Ghost Fathers, or White Fathers, known for their white clothing. Yet the color of Pentecost or the Descent of the Holy Spirit is flame red. 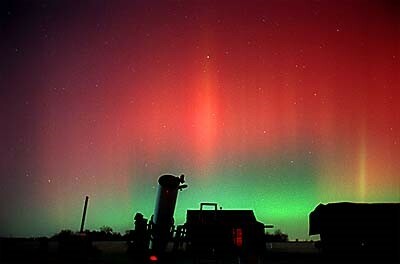 White streaks were seen against a brilliant red color during this remarkable display at the time of Marcel Lefebvre’s passing. It is as though nature, impelled by God, honored a true Saint with a brilliant salutation. If one tilts photo #1 on the computer screen up, gradually up and down, the most brilliant light shape directly under the bright star in the upper middle of the photo looks a little like an Ecclesiastical figure either sitting on a throne or perhaps standing, with a miter shaped cap and the right “arm” raised as if in blessing. It is almost as if there is a rod or cozier in the left hand. It is easy to imagine, anyways. It also seemed remarkable to me that a volcano should stop erupting on the day Archbishop Lefebvre received Extreme Unction. Photo #1 Pennsylvania on the same date and time (10:45 pm., March 25th, American time) as the Archbishop’s death. Paris time would be 9 hours later, the next day. 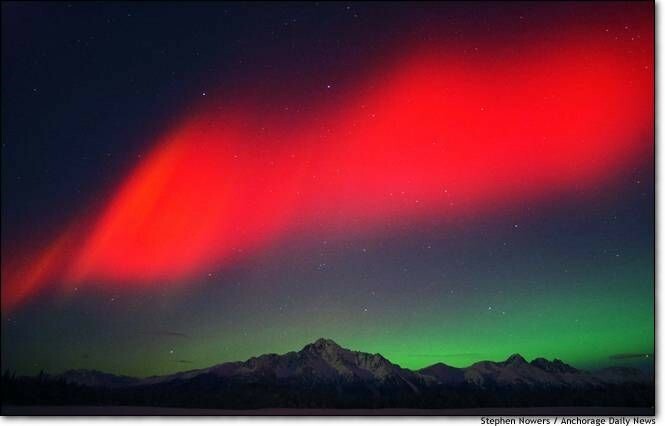 Photo #2 is of a rare red Aurora in Alaska, undated. 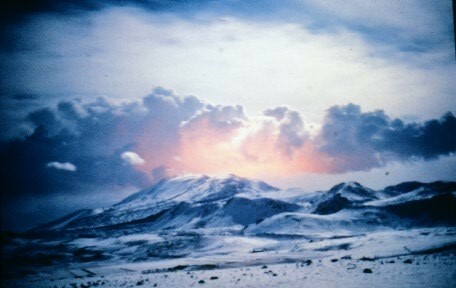 #3 is Hekla volcano eruption from Jan. 17, 1991-March 11th. 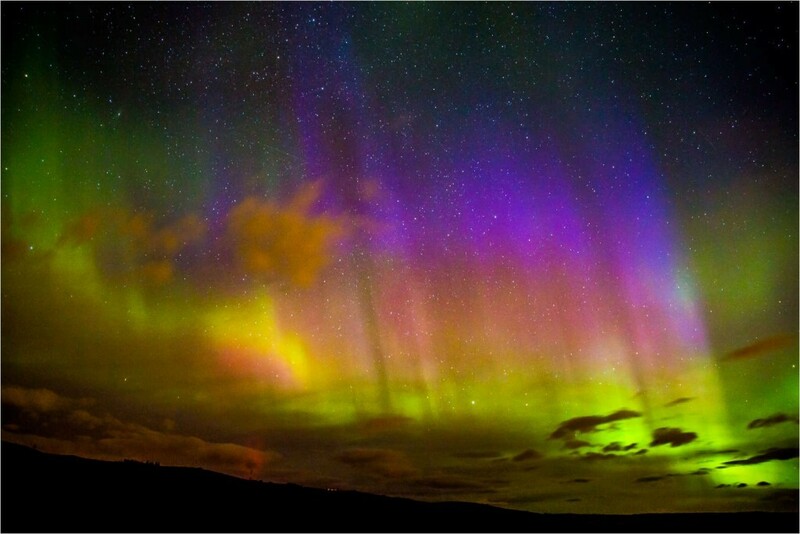 #4 Is an undated photo of a spectacular yellow Aurora. Here is an article from the September 1920 Issue of the Franciscan Herald. It corrects the modern-day lie that the Catholic religion and politics have nothing to do with each other. It also implicitly condemns the teaching of the Second Vatican Council that one has the right to religious liberty (other than the Catholic religion) because if one has the right to religious liberty (other than the Catholic religion), then the nation state does not have the obligation to make the Catholic religion the only state-sponsored one in its (i.e., the state’s) constitution. The following is a story in the life of the saintly Curé D’Ars. The saint had a humourous way of making a point. The man blushed and hung his head. His dog had remained what God had made him, faithful; but he, a Christian, had spoilt the work of God in his soul! Terrified by this unexpected revelation, he reflected for a long time. At last, entrusting to some villagers both gun and dog, he entered the church and went to confession to M. Vianney. Such was his repentance that he burst into tears. Realizing at last the value of his soul, the vanity of the world, and the seriousness of life, he decided to enter religion. “Go to La Trappe!” the Curé d’Ars told him authoritatively. Thus it came about that on December 18, 1852, François Dorel presented himself at Notre Dame d’Aiguebelle, where he took the habit a year later; after a delay of sixteen years he made his solemn profession under the name of Frère Arsène. He died a holy death on December 18, 1888. 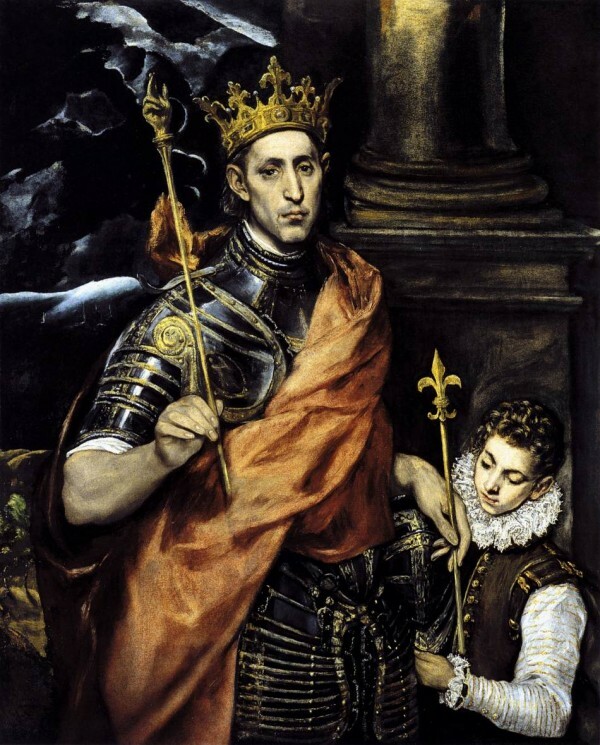 I wish you all, but especially my Franciscan brothers and sisters and the cordbearers of the Archconfraternity, a most blessed Feast of St. Louis IX! Tertiaries (novices and professed) may receive a plenary indulgence today by reciting the formula of profession and following the usual conditions for obtaining a plenary indulgence. Also, cordbearers may receive a plenary indulgence today by renewing their commitment to the Archconfraternity of the Cord of St. Francis and following the usual conditions. Note: this link will connect to a website where you can listen online or download the file. Freedom of speech means practically in our modern civilization that we must only talk about unimportant things. Keep before your eyes the supreme adventure of virtue. If you are brave, think of the man who was braver than you. If you are kind, think of the man who was kinder than you. That is what was meant by having a patron saint. I am quite ready to respect another man’s faith; but it is too much to ask that I should respect his doubt, his worldly hesitations and fictions, his political bargain and make-believe. It is rather ridiculous to ask a man just about to be boiled in a pot and eaten, at a purely religious feast, why he does not regard all religions as equally friendly and fraternal. A friend in the Resistance drew our attention to Fr Pfeiffer’s July 16 sermon. Why does God allow scandals? Why does God allow evil things to happen? Why does God allow evil men to live? Why does God allow tyrants and wickedness and all manner of evil to continue in the world? The chisel is designed to shape saints. The thing about chisels, the saints said in the Middle Ages, chisels are used to carve statues. When the statues are carved, you throw the chisel away and you keep the statue. So God allows there to be wicked things, wicked events, wicked men – remember not only wicked men but also good men do wicked things. Evil is the chisel God uses to make saints. “I am including two little stories of the Holy Rosary that may encourage more people to join the Rosary Crusade. Taken from The Life of St Dominic by Sr. Augusta Theodosia Drane (Mother Frances Raphael). (The Rosary) Many stories are told of the wonders which followed on its first adoption. Some despised it, and ridiculed its use; among whom was one of the bishops of the country of Toulouse (France), who, hearing the Rosary preached by St. Dominic, spoke of it afterwards with contempt, saying it was only fit for women and children. He was soon convinced of his error; for shortly after, falling into great persecution and calumnies, he seemed in a vision to see himself plunged into thick mire from which there was no way of escape. Raising his eyes, he saw above him the forms of Our Lady and St. Dominic, who let down to him a chain made of a hundred and fifty rings, fifteen of which were of gold; and laying hold of this he found himself safely drawn to dry land. By this he understood that it was by means of the devotion of the Rosary he should be delivered from his enemies, which shortly took place after he had devoutly commenced its use. Another similar story relates how a noble lady opposed the new confraternity of this devotion with all her power, but was converted by a vision, which was granted to her one night in prayer. Being rapt in ecstasy, she saw an innumerable company of men and women surrounded by a great splendour, who devoutly recited the Rosary together; and for every “Ave Maria” which they repeated, a beautiful star came forth from their mouths, and the prayers were written in a book in letters of gold. Then the Blessed Virgin spoke to her and said, “In this book are written the names of brethren and sisters of my Rosary, but thy name is not written; and because thou hast persuaded many not to enter it, there shall befall thee a sickness for a time, which yet shall turn to thy salvation.” The lady was soon after seized with sickness, and recognizing the truth of the the prediction, she caused herself on her recovery to be inscribed among the members of the confraternity. Knowing that I do Thy Will, O God. My future to Thy Providence.